Feature This is a brass hose nozzle for basic watering use. The special "Z" buckle design make sit long enough to out of the trigger which is more convenient to control the switch. This "Z" buckle design not only makes it more accessable to switch the trigger control, but greatly saves labor force in the maximum extent during the continuous spraying. 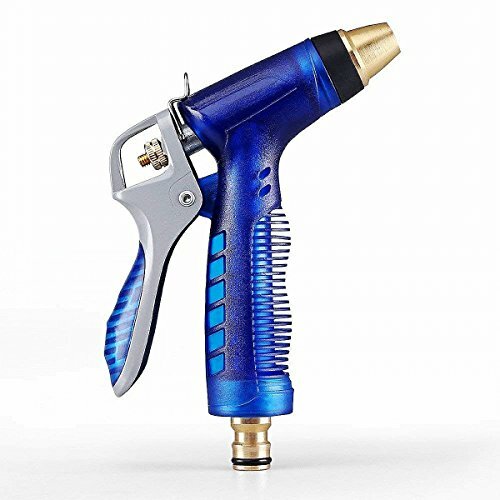 It has two whirling control values, which can freely switch water form and pressure among different working situation for every watering need from watering lawn to cleaning the car, washing pets; and so on...Our product has a special brass trigger with shock resistance gel cover to resist rust and corrosion, and greatly release your hand pressure within a generous appearance. Adjustable settings provide a variety of high water pressures for each irrigation you need,Flexible and adjustable water flow from fine mist, moderate spray, jet stream by rotating the head of the hose nozzle from left to right.Can clean courtyard, drain, deck, irrigate lawn and garden. car washing, cleaning, walkway, yard, gutters, deck, irrigation lawn, garden, washing facilities dogs and pets ect. ERGONOMICS BASED HANDLE - Made of Zinc-alloy covered with blue gel within a heavy duty and good appearance. The gel coverage can not only protect the metal handle, but effectively prevent slipping during continuous watering. The ergonomics based shape design provides you with a more comfortable user experience. WHIRLING CONTROL VALVES - There are two whirling control valves independently control the water flow. One special metal valve setting in front of the trigger to control water pressure. The other one is made of plastic setting with sprayer to control the water form. Both of them can freely switch and change the water form and pressure among different working situation for every watering need from watering lawn to cleaning the car, washing pets, and so on. If you have any questions about this product by OKSANO, contact us by completing and submitting the form below. If you are looking for a specif part number, please include it with your message.